Maintenance of intraoperative normothermia can reduce post operative complications and has been included as part of the SCIP protocol. Nevertheless, both general anesthetics and neuraxial conduction blocks affect the set point for internal temperature control. This results in a 20 fold increase in the interthreshold range. In mammals, normal thermoregulatory control maintains the core body temperature within a tenth of a degree, but can vary by up to 6 degrees C when modulated by anesthetics. increased incidence of morbid cardiac events [1,2]. Increased rate of SSI by a factor of three and increased duration of hospitalization . decreased coagulation ability leading to increased blood loss and transfusions during THA [5,6,7]. Increased duration of post anesthesia recovery . In addition to these, hypothermia results in significant patient discomfort. Some patients report that this outcome is worse than surgical pain. Radiation heat loss is the most important form of heat loss in the OR suite resulting in 40% of the total bodily heat loss during surgery. Since radiation heat loss is proportional to the fourth power of the difference between the absolute temperatures of two surfaces varying ambient room air temperature by a small amount will have dramatic effects on this method of heat loss from the patient. As an example assume an ambient air temperature in the OR suite of 70 degrees F. Given a normal patient with skin temperature of 97 degrees F the radiation loss is q= sigma x (delta T)^4 x Area (Body surface area) =0.48 W/m^2. However, by simply changing the room temperature from 70F down to 65F radiation heat loss increases to 0.94 W/m^2, nearly double. Waiting until the patient is covered with drapes and warm covers (or forced air warming device) to decrease the room temperature can have a large impact on patient care. In our practice, it has become routine to utilize hyerbaric bupivacaine spinal anesthesia for routine and emergent cesarean sections. In addition, it is routine to add IT duramorph and fentanyl to increase the intensity and duration of the spinal block and provide a degree of post operative pain control. Recently I received a call from the OB nurse who was very concerned about a patient in recovery after her Cesarean section in whom they could not measure a temperature. The patient was very diaphoretic, but did not complain of being cold nor was she shivering. Upon closer inspection, it became obvious that she was only diaphoretic from the chest and arms up which is consistent with ongoing spinal block of the abdomen and lower chest which inhibits all sympathetic reflexes including diaphoresis. This 34 year old otherwise healthy G2P1 female at 39 weeks underwent routine c-section lasting about 70 minutes. She had had previous knee and ankle surgery with no problems. Blood loss was 500 cc. She received spinal bupivaine hyperbaric 11 mg with duramorph 250 mcg. Admission temperature was 98F and PACU admission T was 96F. However, one hour later, the patient was diaphoretic and no temperature reading was obtained from the usual methods. Finally, a rectal temperature of 94.4F was obtained. A bear hugger was applied, and three hours later her oral temperature was 98F. Other lab values were normal, and no other problems were encountered. In 1991, Kavee et al. reported that IT morphine augmented the decrease in temperature seen with IT bupivacaine by an average of 1.4 C. In this series, the dose of morphine was 500 mcg, which is no longer used in typical obstetric practice. Since 1991, several other cases of unexplained hypothermia have been published where IT morphine was used for c-section, in dosages from 250 mcg to as low as 100 mcg [17,18, 19, 20]. In 2003, Sayyid et al. published a case report of severe hypothermia after c-section where the nadir of the temperature reached 92.5F three hours after induction of spinal anesthesia. There was no obvious cause for the severe hypothermia. The patient had received spinal anesthetic consisting of bupivacaine 11 mg + morphine 200 mcg + fentanyl of 10 mcg. Importantly, the patient was still very hypothermic 2 hours after active warming. Paradoxically, the authors described excessive sweating in the unblocked dermatomes and no sensation of feeling cold. This constellation of symptoms was typical of those in previous case reports. After 400 mcg of IV naloxone, the patient began shivering. The patient's temperature began to rise as well. In 2005, another case report was published describing similar circumstances . In this post c-section patient 20 mg hyperbaric bupivicaine + 100 mcg morphine were administered and normothermia maintained via heated crystalloid solutions. On admission to the PACU, her temp was 96.2F axillary. Two hours after PACU admission (3 hrs 30 min after spinal), patient presented with excessive sweating in unblocked dermatomes with decreased temperature (94.6F). In 2006 an RCT was performed to verify an association with IT morphine and hypothermia after C-section . 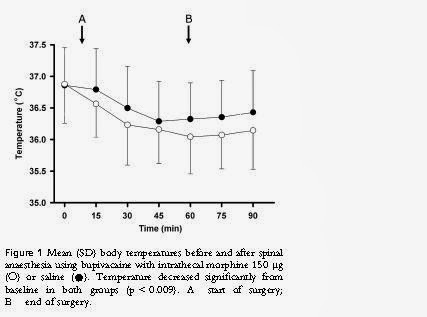 In this study, IT spinal bupivacaine decreased the body temperature by 0.76C and with 150 mcg morphine, the average decrease was 1.11C. However, the lowest recorded temperature in the morphine group was 93.7F vs 95.4F in the saline group. From case reports, it appears that severe hypothermia was often seen in patients given large doses of IT morphine, although, it may occur at lower doses as well. Animal studies have demonstrated that the effect of morphine on thermoregulation is dose dependent . However, Ishak et al. demonstrated that there was no significant difference in the average decrease in temperature between 100 mcg of IT morphine vs. 50 mcg . While it seems plausible from the report by Sayyid et al. that naloxone 400 mcg may reverse the thermoregulatory disturbance caused by IT morphine, there is risk of also reversing its beneficial effects on pain control. Fortunately, it appears that benzodiazapines may be as effective if not more so than naloxone for this purpose. In 2005, Hess et al. published a case series of 14 patients who developed post cesarean section hypothermia after intrathecal morphine. Importantly, each of them complained of being hot and were diaphoretic despite having a temperature of less than 96.4F. Of these 14 patients, four were treated with lorazepam and promptly responded to active warming. The other ten required six hours of conventional methods to reach normal temperature. In this same report, Hess and colleagues followed one hundred consecutive c-section patients to determine the incidence of symptomatic hypothermia after IT morphine and found it to be six percent. While most published case reports are in c-section patients, Ryan et al. published a case of symptomatic hypothermia after 150 mcg IT morphine in a 59 year old women having a TKA . Of course, any patient presenting in the PACU with severe hypothermia with no obvious cause should be carefully evaluated.. Other considerations may include cerebral thromboembolic event or hemorrhage, severe hypothyroidism, carcinomatosis, severe sepsis or peritonitis. Other less likely sources in the perioperative period to consider are pancreatitis and uremia. In most cases, all of these causes will be obvious from the patients history. Hypoglycemia can also result in hypothermia and can be ruled out at the bedside. Hypoglycemia was first shown to be associated with hypothermia in prospective fashion by Strauch and colleagues , in 1969. Later, evidence emerged that hypoglycemia causes hypothermia, and importantly, intracellular CNS glucopenia in particular causes hypothermia. Serum glucose levels, therefore, could in theory be normal, and yet intracellular CNS glucopenia, if present, would result in hypothermia . The current hypothesis as to the cause of severe hypothermia with concomittant diaphoresis and feeling warm is that cephalad migration of morphine will modulate the thermoregulatory area of the hypothalamus resetting the intrinsic thermostat to a lower temperature. This results in severe diaphorsis as the body attempts to cool itself to the new lower set point. Benzos can treat this condition by inhibiting the inhibitor neurons in the Preoptic area that then releases inhibition on the dorsomedial area of the hypothalamus leading to activation of effector neurons to increase body temperature. In the study by Hess, small doses of Lorazepam (1mg) IV push were effective. Several studies have found that above a certain IT morphine dose, no further analgesic benefit can be attained, although the incidence and severity of side effects does continue to increase. Therefore, utilizing the minimal effective analgesic dose is critical to avoid side effects that may be worse than the pain your trying to treat. A systematic review found that while IT morphine is an effective analgesic therapy after cesarean section, doses greater than 100 mcg do not provide further analgesic benefit but do increase the frequency of side effects . This dose has also been shown to be about right for elderly patients undergoing major hip surgery . Other studies suggest that higher doses are more appropriate for TKA (200 mcg), abdominal hysterectomy (200 mcg), abdominal colon surgery (300 mcg) and spinal fusion (400 mcg). After cesarean section, two studies have shown that epidural mophine at 3 mg may be superior to IT morphine in terms of pain control, but the benefit is marginal [24, 25]. The side effect profile is similar between epidural and IT morphine with one exception: there are as yet, no published case reports of symptomatic severe hypothermia after epidural morphine. In conclusion, IT morphine has been proven to effectively decrease IVPCA opioid requirements in a number of surgeries, but is limited by side effects. One of the adverse effects to be aware of is protracted and significant hypothermia secondary to thermomodulation at the hypothalamus secondary to cephalad migration. Because hypothermia is associated with and causal of numerous negative outcomes, recognition and treatment should be prompt. This syndrome is easily recognized by its production of a hypothermic patient who is feeling warm and diaphoretic in unblocked dermatomes. Treatment should be active warming plus low dose lorazepam. 1. Frank SM et al. JAMA 1997; 277:1127-34. 2. Frank SM et al. Anesthesiology 1993; 78: 468-76. 3. Frank SM et al. Anesthesiology 1995: 82:83-93. 4. Kurz A, Sessler DI, Lenhardt RA. NEJM. 1996;334:1209-15. 5. Schmied H, Kurz A, Sessler DI et al. Lancet 1996; 347:289-292. 6. Winkler et al. Anesth Analg 2000;91:978-84. 7. Widman J et al. Anesth Analg 2002; 95:1757-62. 8. Lenhardt R et al. Anesthesiology 1997; 87:1318-23. 9. Sayyid, SS, Dima JG et al. Hypothermia and Excessive Sweating Following Intrathecal Morphine in a Parturient Undergoing Cesarean Delivery. Reg Anesth Pain Med 2003; 28:140-143. 10. Bicalho GP et al. Excessive Sweating and Hypothermia after Spinal Morphine. Case Report. Rrevista Brasileira de Anestesiologia 2006; 56: 52-56. 11. Strauch BS, Felig P, Baxter JD Schimpff SC. JAMA 1969; 210:345-6. 12. Freinkel M et al. NEJM 1972;287: 841-5. 13. Hui CK, Huang CH, Lau CJ et al. A randomised double-blind controlled study evaluating the hypothermiic effect of 150 mcg morphine during spinal anaesthesia for Caesarean section. Anaesthesia 2006;61:29-31. 14. Kavee EH. et al. The Hypothermic action of epidural and subarachnoid morphine in parturients. Regional Anesth and Pain Med 1991; 16:325-8. 15. Clark SM, Murphy MT, Lipton JM et al. Brain Res Bull 1983; 10: 305-8. 16. Ishak M, Tarraf S, et al. Will the Body Temperature by Affected by Lowering IT morphine dose from 100 to 50 mcg? Anesthesia & clinical Res 2013;4:6. 17. Fisher MO. et al. Hypothermie apres rachianesthesie: role de la morphine? Annales Francaises D'Anesthesie et de Reanimation 2006; 25: 296-8. 18. Harkouk H. et al. Hypothermie profonde apres rachianesthesie et morphine intrathecale apres cesarienne: un nouveau cas clinique. Annales Francaises d'Anesthesie et de Reanimation 2013; 32: 53-5. 19.Wishaw K. Hypothermia associated with subarachnoid morphine .Anaesth Intensive Care. 1997 Oct;25(5):586. 20. Kosai K, Takasaki M, Kawasaki H et al. Hypothermia associated with intrathecal Morphine. J Anesth 1992; 6:349-52. 21. Hess PE, Snowman CE, Wang J. Hypothermia after Cesarean Delivery and its reversal with Lorazepam. Int J Obstet Anesth 2005; 14:279-83. 22. J. B. Dahl, I. S. Jeppesen, H. Jørgensen, J. Wetterslev, and S. Møiniche, “Intraoperative and postoperative analgesic efficacy and adverse effects of intrathecal opioids in patients undergoing cesarean section with spinal anesthesia: a qualitative and quantitative systematic review of randomized controlled trials,” Anesthesiology, vol. 91, no. 6, pp. 1919–1927, 1999. 23. P. M. Murphy, D. Stack, B. Kinirons, and J. G. Laffey, “Optimizing the dose of intrathecal morphine in older patients undergoing hip arthroplasty,” Anesthesia and Analgesia, vol. 97, no. 6, pp. 1709–1715, 2003. 24. Duale C, Frey C, Bolandard F et al. BJA 2003; 91: 690-4. 25. Sarvela J, Halonen P, Soikkeli A, Korttila K. Anesth Analg 2002; 95:436-40. 26. Ryan KF et al. Persistant hypothermia after intrathecal morphine: A case report and literature review. Can J Anesth 2012;59:384-8.